Warren Wilson College | Soccer | Asheville Shield F.C. On US-70, go 1.5 miles until you reach the next traffic light and turn left onto Warren Wilson Road. Travel about 1.5 miles until you reach the campus. Turn left at the North entrance (just past the pedestrian bridge) and bear left at the first split (College Chapel), continue straight. DeVries Gymnasium will be on the right. Parking is available on the rightand the Warren Wilson Soccer Fields are past the tennis courts on the right. 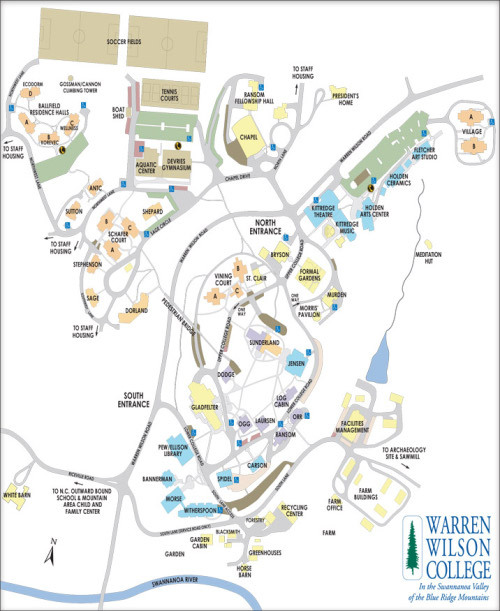 If you are traveling on I-40 east of Asheville take Exit 59 (Swannanoa) which has a "Warren Wilson College" sign. Bear right at the exit and go to the traffic light at the intersection with US-70. Turn left and go about 2 miles until you reach the second traffic light. Turn right on Warren Wilson Road. Go about 1.5 miles until you reach the campus. Turn left at the North entrance (just past the pedestrian bridge) and bear left at the first split (College Chapel), continue straight. DeVries Gymnasium will be on the right. Parking is available on the rightand the Warren Wilson Soccer Fields are past the tennis courts on the right. In the event of snow and ice, you can call 828-258-4521 for a recorded message. Usually the best route to campus is from I-40 exit 59. From U.S. 70 East, cross the Swannanoa River onto Old U.S. 70 and turn left. After a short distance bear right onto Bee Tree Road. Continue on Bee Tree Road until you pass the sign for Bee Tree Community and the road becomes Warren Wilson Road in approaching Owen Manufacturing. If you are driving a large vehicle, bus, or trailer, turning left off of Warren Wilson Road onto Chapel Drive to get to DeVries Gym can present problems. There is a dip in the road where large vehicles can scrap or get hung up. It is advised for these larger vehicles to enter in from the north and make a right turn onto Chapel Drive to get to DeVries Gymnasium (see image below).